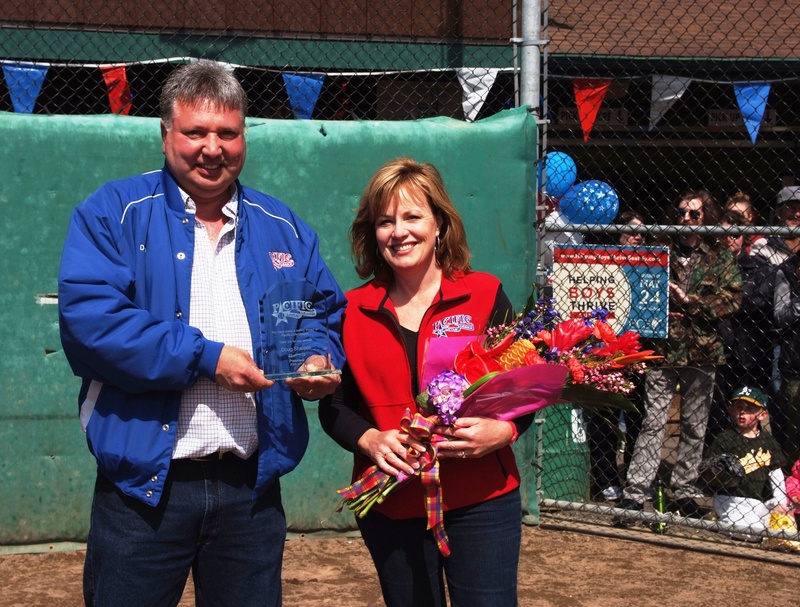 Long-time leaders, Doug and Carol Sheldon, were honored at the ceremony. Doug is President of PLL, and Carol is PLL Day Chair. They are retiring from their service to the league after this baseball season. Photos are courtesy of PLL. Unless otherwise marked, photos were taken by Marc Bryce, Designer Portrait Studio, http://www.thedesignerportraitstudio.com. Please click on any photo to enlarge it. Doug and Carol Sheldon, honored for long-time, expert service to PLL. This entry was posted on June 7, 2014 at 4:46 am	and is filed under Ceremonies & Celebrations. Tagged: Boy Scout Troup 304, bugle, Doug and Carol Sheldon, Girl Scout Troop 42086, Pacific Little League, To the Color. You can follow any responses to this entry through the RSS 2.0 feed. You can leave a response, or trackback from your own site.